My bed is without a doubt my favourite place in the world but I really struggle with mornings. I'm not even a night owl but come morning it's a struggle to remove myself from the soft duvet goodness every day. I've been trying to turn this around and become a morning person lately and I think I'm slowly getting there! Usually I bath in the evenings so I have time to faff about and have a bit of a pamper at the same time, but to make sure I have to get up early I've been leaving hair washing til the morning. That way I know I have to get up with plenty of time to hit the shower as can't stand greasy hair! I've mentioned before that I use products aimed at coloured hair to protect my 'do but once a week I like to use nice clarifying products to shift product build up. 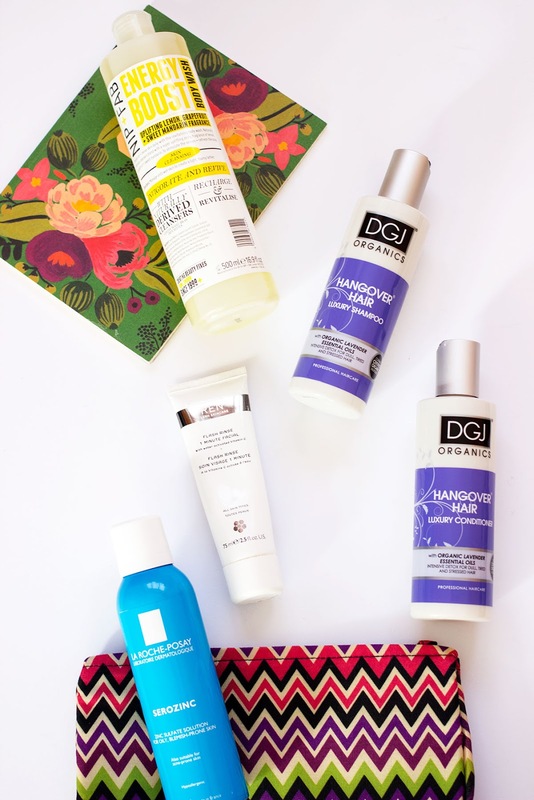 The DGJ Organics Hangover Hair Luxury Shampoo and Conditioner* fits this bill and it leaves my hair feeling really clean and light without stripping it. There's something about super clean hair which really helps wake me up. That and the drone of a hairdryer of course! The Hangover Hair range contains lavender essential oils so it smells pretty dreamy too. There's also wheat protein which helps rebuild your hair and get it back in tip-top condition so if you've had a night on the tiles this is a good one to kick-start you the next day! Nothing says wake me up more than citrus so the Nip + Fab Energy Boost Body Wash* is a must-have in the morning for me. It smells wonderful thanks to a blend of grapefruit, lemon and sweet mandarin and I find my skin feels soft and nice afterwards. It's also the biggest bottle of body wash I think I've ever seen so great value for money, even though I'm getting through it a bit now (it's that good!). I've said before how much I rate Nip + Fab for body products and this is another that doesn't disappoint. I've accumulated quite a collection now so they get a big thumbs up from me. The Ren Flash Rinse 1 Minute Facial has to get a mention as it gently exfoliates my skin and makes me look a whole lot more awake than I probably am! I talk about this all the time but it's so worth checking out. I usually pop this on then brush my teeth so my skin really benefits from it and I'm left with smooth and radiant skin. It's love, guys. The ultimate pick me up has got to be a refreshing spritz of toner and La Roche-Posay Serozinc is my morning go-to. This gives my skin a good dose of zinc and really helps calm things down when a flare up is in full swing. I saw this in Boots the other day (and there's a cheeky 25% off) so this is most definitely a staple for me now. I always have breakfast when I get to work so I try and have something healthy like Greek yoghurt and granola which gives me a bit of energy without being too heavy. Hopefully this balances out my morning Latte or anti-grump juice as I like to think of it! Do you have any tips for becoming a morning person? The post Becoming a morning person appeared first on Lelore.